We loved the home so much! I sent a longer letter about the place, but it really was a dream, from the setting to the architecture to the amenities. The only suggestion I have is some way to cool the house other than fans. It got hot at night when we were sleeping and we had to sleep with the door open. Otherwise it was amazing. Loved the movie selection too, and the fire pit by the water! Very neat and tidy. Pleasing furnishings and plenty of dishes. Large (narrow) deck with gorgeous view of the lake. Nice amenities in common areas and wonderful outdoor deck/patio with gas fireplace lit every night. Good access to lake shore. Bonfires encouraged. Loved the shore-side location and abundance of local resource materials from birding to hiking plus unit was well stocked with essentials. Really enjoyed our stay. Great room/condo, really nicely set up and equipped with all utensils and cooking supplies. Really just perfect overall! The only thing missing was information on firewood - where to get it, how much if any does it cost, ect. Suggestion: Include some firewood as part of the fee, or offer it as a reduction if you will not be using any. Secondly, add some additional outside fire rings closer to each room, rather than a common site. Its was a beautiful home. Perfect for our stay. We will be back for sure. We enjoyed the location and the layout of the home. It was nice to have bathrooms for each of the sleeping areas and the decks/patios were amazing. This was a great stay! Magnificent views from the deck, breakfast on the deck each morning as well as after hiking for the day,kitchen had all the basics we needed, lots of space for family time together,and a beautiful Superior beach a quick walk from unit. Only suggestion to improve- we arrived after dark (and other nights came back from hiking and supper after dark) and outside motion light did not work. We would highly recommend and would stay here again. We loved everything about the lodge. Booking was very easy and response time on questions was very prompt. Hope to come back. Very peaceful and lovely. Quiet, cozy and very pretty. We were very relaxed. If a negative, maybe a little too cluttered and not much room for renters to put our stuff. Quality of cookware were much above expectation. We had a great stay at Minnieme. The home needs some maintenance, but it was clean and comfortable. We loved being able to hear the Lake from the cabin, and the deck. Our favorite thing was the view, of course. Our least favorite thing was the next door neighbor who was in love with his power tools and seemed to have to wash/grind/clean very loudly any time we were out on the deck. This little cabin is just a gem. Very comfortable, efficient, all needs met re amenities etc. But the best part is the amazing location - right on the edge of the rocks looking out at a beautiful little bay and that LAKE - while I was there the waves were crashing onto the rocks and the cliff just to my right - looked like a mini Cornwall to me. And being only 3 miles from Grand Marais is so helpful. It was perfect for our 4days. 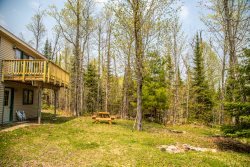 Enjoyed the privacy, the view, the space and the location to the 4 hiking spots close to Tofte. The unit where we stayed was clean and comfortable with a nice view of lake. Kitchen area is a little bit tight but manageable. This home is beautiful. The windows and paneling and the view of the lake are amazing. The kitchen had much of what we needed for basic meals. The location was amazing, being so close to the lake. The ability to have a bonfire on the beach was wonderful. We also loved being so close to great hiking trails. The house itself was very cozy and welcoming. We really have no complaints except for the water. We appreciated having drinking water provided as the tap water tasted terrible. It was also very hard to wash my hair with the water in the shower. If there is one improvement to be made it would be the water. Getting the key was super easy. We absolutely loved staying here and will definitely be back. In 37 years of coming up to Lake Superior and staying at a variety of hotels and cabins; this was, hands down, the best place I've ever stayed. An excellent stay for a family of four over Labor Day weekend! The place was comfortable, well-maintained, and high-quality furnishings. GORGEOUS view of Lake Superior! We'll be back to Chateau LeVeaux and this particular unit (25). The room was good. The only minus for us was the shower. Very low water pressure. Made me not even want to take a shower because of it. Not sure if this is an issue in the other rooms or just ours. Other than that it was comfortable and we had everything we needed. The location was great. Close to the sites we were interested in. Loved being right on the lake & enjoying the views from our room. We liked being on the ground level. We were easily able to walk out our patio door and grill or use the firepit. Amenities were fine for what we needed. The cabin was wonderful; right on the lake and it was very private. It had every amenity one would need for a stay on the north shore. We loved the cabin and especially the close and private proximity to the lake! The cabin was wonderfully furnished, and we really appreciated amenities of dishes, pots, silverware, microwave and soap. We would be happy to return!